MK-2206 2HCl is a highly selective inhibitor of Akt1/2/3 with IC50 of 8 nM/12 nM/65 nM in cell-free assays, respectively; no inhibitory activities against 250 other protein kinases observed. Phase 2. Inhibition of AKT signaling abolishes MKK4 phosphorylation on Ser78 in injured axons. Cultures of sensory neurons were treated with 5 µM MK-2206 or 5 µM GDC-0068 for 1 hr prior to axotomy. Axonal proteins harvested at indicated time points after axotomy were subjected to immunoblot analysis. Perifosine (KRX-0401) is a novel Akt inhibitor with IC50 of 4.7 μM in MM.1S cells, targets pleckstrin homology domain of Akt. Phase 3. Tumor growth of 827 GSC-derived xenografts treated with an AKT inhibitor perifosine (30 mg/kg body weight). Twenty-three days after tumor implantation in mice, perifosine was administered by intraperitoneal injection (daily for 5 days). Error bars represent SD. Five mice per group, *p < 0.01. GSK690693 is a pan-Akt inhibitor targeting Akt1/2/3 with IC50 of 2 nM/13 nM/9 nM in cell-free assays, also sensitive to the AGC kinase family: PKA, PrkX and PKC isozymes. Phase 1. UPN cells were treated with GSK690693 or MK2206 (1 uM) for 1h followed by LPA (10 uM), EGF or IGF-1 (10 ng/ml) for another 1h and Western blot was performed. Band intensities of phospho-AKT (p-AKTS473), phospho-S6 (p-S6S240/S244), phospho-YB-1 (p-YB-1S102) and YB-1 were quantified and normalized to the intensity of ERK2. It directly determined the role of AKT using two potent, AKT inhibitors with distinct actions—a catalytic domain inhibitor, GSK690693, and an allosteric inhibitor, MK2206 -in UPN and SKOV3 cells, which showed appreciable AKT and YB-1 phosphorylation upon growth factor stimulation. GSK690693 increased basal and growth factor-induced AKT phosphorylation due to blocking a negative feedback loop downstream of AKT, whereas MK2206 abolished both basal and growth-factor-induced AKT phosphorylation. Ipatasertib (GDC-0068) is a highly selective pan-Akt inhibitor targeting Akt1/2/3 with IC50 of 5 nM/18 nM/8 nM in cell-free assays, 620-fold selectivity over PKA. Phase 2. AZD5363 potently inhibits all isoforms of Akt(Akt1/Akt2/Akt3) with IC50 of 3 nM/8 nM/8 nM in cell-free assays, similar to P70S6K/PKA and lower activity towards ROCK1/2. Phase 2. HEK293T cells stably expressing mTOR mutants (H1968Y, P2213S, and S2215Y) were constructed by TALEN. After nutrient starvation, wild-type (WT, for HEK293T cells not expressing mutants but wild-type mTOR after TALEN edition and selection) or mutated HEK293T cells (heterozygous, A) were treated with indicated inhibitors or vehicle. The activation of indicated molecules was examined by Western blotting. SC66 is an allosteric inhibitor which displays a dual-inhibitory function toward AKT activity with IC50 values of 0.77, 2.85 and 0.47 μg/ml in HepG2, Huh7 and Hep3B cells after 72 h treatment, respectively. AT7867 is a potent ATP-competitive inhibitor of Akt1/2/3 and p70S6K/PKA with IC50 of 32 nM/17 nM/47 nM and 85 nM/20 nM in cell-free assays, respectively; little activity outside the AGC kinase family. (B) Treatment of HEK293T cells with the AKT inhibitors MK2206 or AT7867 abolished EGF (20 ng, 15 min)-induced binding of AKT and pT308AKT to CNK1 and also their residual interaction found in non-stimulated cells. Triciribine is a DNA synthesis inhibitor, also inhibits Akt in PC3 cell line and HIV-1 in CEM-SS, H9, H9IIIB, U1 cells with IC50 of 130 nM and 20 nM, respectively; does not inhibit PI3K/PDK1; 5000-fold less active in cells lacking adenosine kinase. Phase 1/2. Effects of FAK A., PI3K B. or Akt C. inhibition in D-Hep2/AURKA cells on dormancy-related protein expression as analyzed by western blotting. P130 and E2F4 levels were increased, while P107 and Ki67 were decreased. Dormancy-related protein ratio in D-Hep2/AURKA cells treated with TAE226 D., Omipalisib E. or Triciribine F.
CCT128930 is a potent, ATP-competitive and selective inhibitor of Akt2 with IC50 of 6 nM in a cell-free assay, 28-fold greater selectivity for Akt2 than the closely related PKA kinase. A-674563 is an Akt1 inhibitor with Ki of 11 nM in cell-free assays, modest potent to PKA and >30-fold selective for Akt1 over PKC. 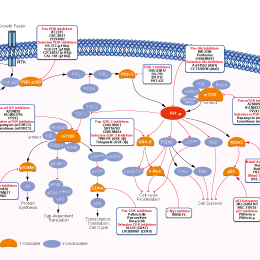 Cell survival was determined using a WST-1 assay in the human lung cancer cells A549 A. and NCI-H358 B. following treatment with either an AKT1 specific inhibitor, A-674563 (black circle and line) or a pan-AKT inhibitor MK-2206 (gray square and line). *p < 0.05. PHT-427 is a dual Akt and PDPK1 inhibitor (high affinity binding for the PH domains of Akt and PDPK1) with Ki of 2.7 μM and 5.2 μM, respectively. Luciferase reporter assays. 32D/BCR-ABL cells transfected with the reporter construct containing 1548 bp of the Atf5 promoter were treated with either DMSO, imatinib (5 μM for 24 hours), LY294002 (20 μM for 48 hours), PHT-427 (20 μM for 24 hours), or JAK inhibitor I (10 μM for 24 hours). Error bars represent SD. Miltefosine inhibits PI3K/Akt activity with ED50 of 17.2 μM and 8.1 μM in carcinoma cell lines A431 and HeLa, first oral drug for Visceral leishmaniasis, effective against both promastigotes and amastigotes. Effects of a miltefosine co-treatment with celecoxib on steatohepatitis, hepatocyte apoptosis, Akt activation and p53 expression in the liver of MCD-diet fed mice. Mice were fed the control diet, an MCD diet, an MCD diet with celecoxib (20 mg/kg/day) treatment, or an MCD diet co-treatment with celecoxib and miltefosine (50 mg/kg/day) for 3 weeks. (C) TUNEL-stained sections of liver samples are representative of the indicated groups (magnification×400). Abbreviations: MCD, methionine and choline deficient; CON, control; CEL, celecoxib; MTF, miltefosine. Honokiol is the active principle of magnolia extract that inhibits Akt-phosphorylation and promotes ERK1/2 phosphorylation. Phase 3. (B) Cleaved PARP, Bax and Bcl2 protein expression was evaluated by immunoblotting of KRAS mutant cells lysates after 48 h of honokiol (10, 20, 40, and 60 μM) treatment. ∗∗P < 0.01 and ∗∗∗P < 0.001 for comparison between control group and honokiol-treated group. TIC10 Analogue is an analogue of TIC10, which inactivates Akt and ERK to induce TRAIL through Foxo3a, possesses superior drug properties: delivery across the blood-brain barrier, superior stability and improved pharmacokinetics. Phase 1/2. Uprosertib (GSK2141795) is a selective, ATP-competitive, and orally bioavailable Akt inhibitor with IC50 of 180 nM, 328 nM, and 38 nM for Akt 1, 2 and 3, respectively. Phase 2. Parental cell line wastreated with Akt inhibitor (GSK2141795) and BGJ398. The 5 uM BGJ398 resistant cell line was treated with GSK2141795, BGJ398, and 2 concentrations of GSK2141795 and varying dosages of BGJ398. The parental cell line treated with GSK2141795, the dark green line, indicates minimal effect of the inhibitor compared to the resistant cell line treated GSK2141795, the light purple line. However, when the resistant cell line is treated with both GSK2141795 and BGJ398 there is a greater decrease in cell viability compared to the resistant cell line that is treated only with GSK2141795. TIC10 inactivates Akt and ERK to induce TRAIL through Foxo3a, possesses superior drug properties: delivery across the blood-brain barrier, superior stability and improved pharmacokinetics. Phase 1/2. Established HCC cell lines, HepG2 (A-C) and Huh-7 (D), primary human HCC cells (D, "Pri_1/Pri _2"), as well as HL-7702 human hepatocytes (D) and primary human adult hepatocytes ("Hepatocytes", D), were either left untreated ("C", same for all figures), or treated with applied concentration of TIC10 (0.1-30 μM), cells were then cultured in conditional medium for applied time; Cell proliferation was tested by MTT assay (A and D), clonogenicity assay (B) and [H3] Thymidine incorporation assay (C). Experiments in this figure were repeated for five times, with similar results obtained. n = 5 for each repeat. Bars stand for mean ± SD. *p < 0.05 vs. group "C". Akti-1/2 is a highly selective Akt1/Akt2 inhibitor with IC50 of 58 nM/210 nM, respectively, about 36-fold selectivity for Akt1 over Akt3. AKTi-1/2 inhibits human HCC cells in vitro. Human HCC HepG2 cells (A–F), Huh-7 cells (G), primary human HCC cells (“Pri HCC”, G) or the primary liver cells (“Pri liver cells”, G) were treated with/out applied concentrations of AKTi-1/2 for indicated time; Cell survival (A, B and G), proliferation (C and D) and apoptosis (E and F) were tested by the listed assays. Data were shown as the mean (n = 5) with the standard deviation (SD). Experiments in this figure were repeated three times, with similar results were obtained. *P < 0.05 vs. “C” (untreated control) group. ARQ 092 is a novel, orally bioavailable and selective AKT pathway inhibitor exhibiting a manageable safety profile among patients with advanced solid tumors. Afuresertib (GSK2110183) is a potent, orally bioavailable Akt inhibitor with Ki of 0.08 nM, 2 nM, and 2.6 nM for Akt1, Akt2, and Akt3, respectively. Phase 2. Analysis of the mechanism of action of the enhanced anti‑tumor effect of the combination therapy of suboptimal doses of pomalidomide plus dexamethasone and afuresertib in MM cells. (A‑C) The altered expression of protein substrates was analyzed in two MM cell lines that were treated with suboptimal doses of PD, or AFU, or the PD and AFU combination. The XG‑7 and U266 cell lines were subjected to the indicated treatments for 48 and 72 h, respectively. (A) Caspases, (B) substrates related mainly to the working mechanism of IMiDs, (C) substrates mainly related to the working mechanism of afuresertib, and (D) two primary MM cell cultures, were subjected to the analysis in the same manner as the two MM cell lines. In the expression panel of p‑FoxO3a/FoxO1, the upper band represents p‑FoxO3a and the lower band represents p‑FOXO1. PD, pomalidomide plus dexamethasone; AFU, Afuresertib; MM, multiple myeloma; IMiDs, immunomodulatory drugs. AT13148 is an oral, ATP-competitive, multi-AGC kinase inhibitor with IC50 of 38 nM/402 nM/50 nM, 8 nM, 3 nM, and 6 nM/4 nM for Akt1/2/3, p70S6K, PKA, and ROCKI/II, respectively. Phase 1. AT13148 exerts cytotoxic and anti-proliferative activity against human gastric cancer cells. Human gastric cancer cells (HGC-27, AGS, SNU-601, N87 and MKN-28 lines) or GEC-1 gastric epithelial cells were treated with applied concentration of AT13148 for indicated time, cell survival (A and E), cell proliferation (B and F), cell cycle distribution (C, for HGC-27 cells) and cell death (D, for HGC-27 cells) were tested by the described assays, separately. Data were presented as mean ± SD. “Ctrl” stands for untreated control cells (For all figures). “hr/hrs” stands for hour/hours (For all figures). Experiments in this figure were repeated for five times. *p < 0.05 vs. “Ctrl” group. Deguelin, a natural product isolated from plants in the Mundulea sericea family, is an PI3K/AKT Inhibitor.